Manufacturing facilities can be loud, dangerous, and dirty. Communicating effectively is one of the best ways to prevent injury, accidental damage to inventory or property, and quickly cleaning up messes that could cause additional problems. Two way radio walkie talkies are created to help manufacturing plants improve communication and operate effectively. Two way radios are rugged, most of them being able to withstand a five-foot drop on concrete, and have loud, clear speakers so you can make sure your message gets through. 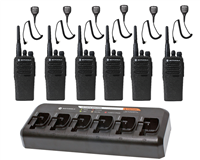 If you're in a particularly loud area, you can pair your two way radio with a remote speaker microphone, earpiece, or other audio accessory, which allow for even clearer and private communication. Two way radios are also available in intrinsically safe versions to better prevent injury. Whether you are a large operation or a small facility, two way radios can help improve your safety precautions, communication, and work efficiency. Take a look below or give us a call today! For smaller manufacturing plants, the Motorola RMU2040 is affordable and durable with great audio quality. The RMU2040 will communicate up to 250,000 square feet in most circumstances, although this can vary greatly depending on the amount of steel, concrete, walls, and other objects in plant. Most manufacturing plants will need a more powerful two way radio. The Motorola RDU4100 is a great option for communicating through steel, concrete, and other objects both indoors and outdoors. This radio has an outstanding battery life and great audio quality. The Motorola RDV5100 is also very powerful but is better suited for operations that are outdoors only. All three of these Motorola two way radios can be paired with the HKLN4604 Swivel Earpiece or the HKLN4606 Remote Speaker Mic.